Sometimes it’s simply not enough to just watch 007 dipping his feet in crystal clear waters and sipping on Martinis, you want to be there too. Now you can. After ‘The Man with the Golden Gun’ and ‘Tomorrow Never Dies’ featured scenes filmed in and around Thailand, tourists desire to visit, rose and this resulted in the renaming of an island and several monuments becoming tourist attractions. The previously unknown Khao Phing Kan blissful islands are now a major tourist attraction after they lent themselves to the filming of ‘The Man with the Golden Gun’. To walk along the same golden sands Roger Moore did back in 1974 and to re-enact the Bond and villain Scaramanga (Christopher Lee) western shootout scene with your friends take a trip to ‘James Bond island’. Unfortunately we can’t guarantee you’ll see Ursula Andress or Daniel Craig strut out of the water! Tour buses leave Phuket every day to the island which takes thousands of eager Bond fans to popular monkey caves, a spot of lunch at a Muslim fishing village before sailing off to ‘James Bond island’. Some bar and restaurants lie on the island, and you’re given about an hour to take some photos, have a bite to eat and a beer before you’re hustled back onto the boats. The island itself is stunning so if you prefer to have longer to appreciate it, then book yourself onto a June Bartha cruise. After you board a traditional Siamese Junk, the cruise- which can be enjoyed anytime of the day- takes you to the island and allows you to stay for a few hours. The boat itself resembles a similarity to the one Scaramanga owned in the film so practice your evil laugh and gun stance whilst you sail along the green waters. If you take a drive along Ratchadamnoen Klang Road in the heart of Bangkok, you’ll see a few famous monuments that appear in the car chase scene between 007 and Scaramanga in ‘The Man with the Golden Gun’. The Democracy monument lies on the Dinso Road intersection which is seen in the film and then further down the road, the ‘Giant Swing’ comes in shot which is seen briefly during the car chase. The swing sits in front of the ‘Wat Suthat’ temple that is also seen briefly. Despite wanting to film half of ‘Tomorrow Never Dies’ in Vietnam, the production team were forced to relocate to Bangkok. 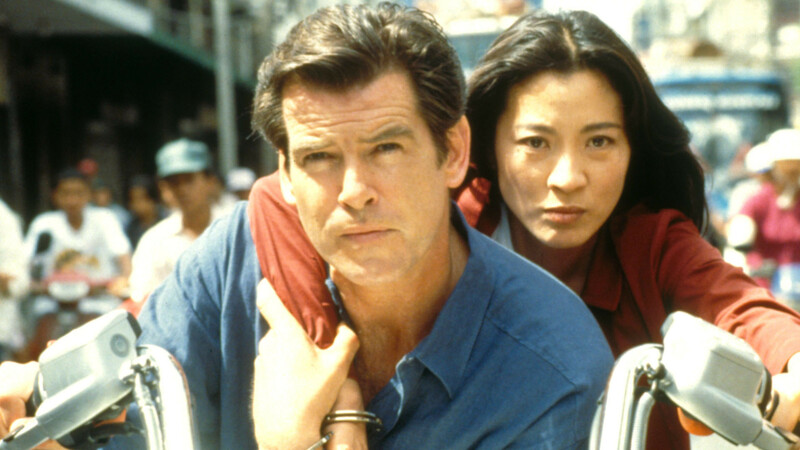 During the second half of the film, James and ‘Bond girl’ Wai Lin climb down a skyscraper. We don’t recommend you climb down the Westin Banyan Tree Hotel but we do recommend you stay there. At around £140 a night it’s not cheap but with skyscraper views, a rooftop restaurant, luxurious spas and outdoor swimming pool it’s got 007 written all over it. So book yourself a room, and don’t worry we won’t tell if you use the pseudo, ‘James Bond’. For a cheaper version of touristy, visit the idyllic Mahogany Wharf where Bond battles against his enemies in an adrenaline-fuelled bike chase.